With the nearly infinite designs and configurations of lamps, you'll find a similarly large selection of parts with which to construct your own. For brevity's sake, let's examine what one would need to construct a simple single-bulb table lamp. The core of any lamp, whether it be a table lamp, floor lamp, candelabra or chandelier, is its electrical components. For a simple table lamp, only a handful of parts is needed to make it functional. First you'll need a socket, which is the part that holds the bulb and most often the knob or switch to control the lam -- although some lamps do instead use a switch located on the cord. Secondly, you'll need a cord and a plug. Cords with plugs already attached are readily available in most hardware stores if you're not too picky about the length, color and gauge. Lastly, you'll need to select a bulb for your lamp. Make sure you take into consideration the power rating of the bulb and the socket when making your selections. If you've selected a three-way socket, make sure to get a three-way bulb with wattage ratings matching those of your socket. You also don't want to get a bulb with a power rating lower than your socket. This can greatly shorten the lifespan of your bulb, if not burn it out as soon as the lamp is turned on. Consider the design when selecting the body and shade for your lamp. Whether you go with store-bought components or all homemade, your options are limited only by your imagination. You will need to plan out your project beforehand so as to streamline your part purchasing process. Things to consider here aside from design are how your lamp will eventually be assembled. This will more than likely impact which electrical parts you choose due to the various manners in which some of them attach to a lamp body and shade. 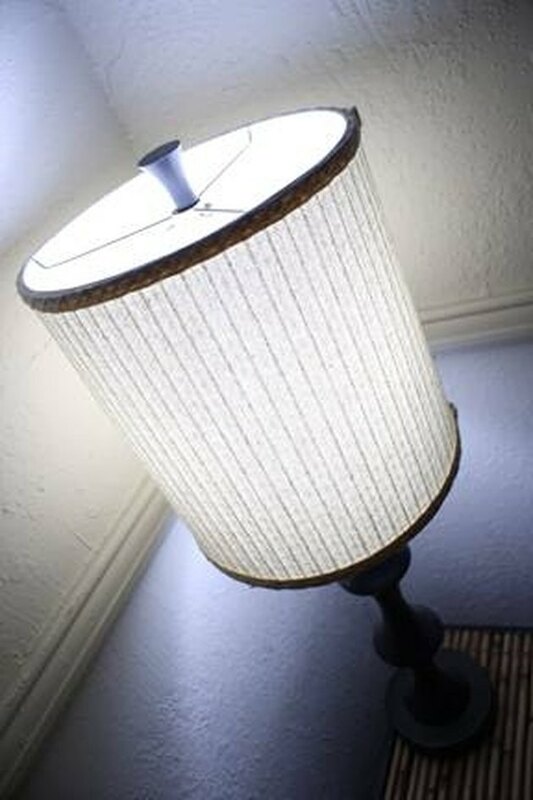 For example, there are two basic ways a lamp shade can attach to your lamp. The first is called a harp, which it consists of a light gauge bent brass or steel rod that connects to a saddle beneath the socket and arches up over the bulb to be capped with a mounting screw. The second is called a bulb adapter, and as its name hints, it clips to the bulb via two metal hoops descending from a mounting screw. Some lamp shades even come with integrated bulb adapters. As for the shade itself, you can again go with a store-bought shade or make one yourself. Whichever you choose, make sure its mounting method is compatible with your other components and its design coordinates well with your base. Assuming you've chosen the total DIY path, you'll need a few tools and supplies to assemble all of your parts and components into their finished form. Starting with your electrical components, you'll want to have on hand a pair of wire strippers/cutters, two screwdrivers (one Phillips head and one flat), a pair of needle-nose pliers, electrical tape and twist-on wire connectors (sometimes called screw caps). This should cover just about any electrical assembly needs you'll have. It is important to plan out your assembly process before beginning if for no other reason than to save you the hassle of having to disassemble your lamp partway through and start over because something small has been overlooked. It's wise to plan your project as well as you can before you purchase your first part. If you're building/assembling a lamp for the first time, be sure to research all of your options before you begin and don't be afraid to scrap your "Plan A" partway through your process in favor of Plan B, C .... or even D. But most of all, just have fun with it. Do You Need a Special Bulb for a Touch Lamp?